For many people, Thanksgiving is synonymous with a festive spread that features roast turkey and all the trimmings. Yet for a growing number of Americans who celebrate what has come to be called “ThanksLIVING”, the menu includes only plant-based dishes out of respect and compassion for all life. Why not consider making this Thanksgiving for you and yours a ThanksLIVING by modifying tradition to include non-violence toward all beings and caring for the earth and your own health? One of the annual ThanksLIVING celebrations takes place in Tempe, Arizona at Damon Brasch’s restaurant, Green. He invites area residents to enjoy a meal that includes a main course of seitan, the vegetarian “wheat meat”, along with vegan giblet gravy, cranberry walnut stuffing, roasted garlic mashed potatoes, sweet corn, asparagus, salad, and assorted artisan breads. For dessert, he serves vegan pecan pie with soy whip topping and winter berry cobbler. 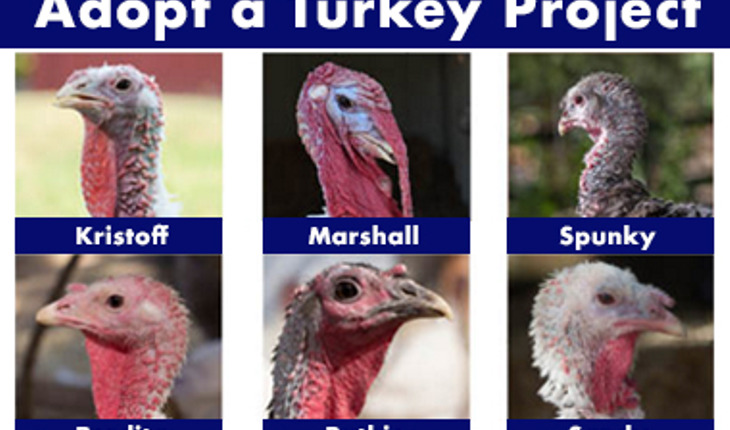 In case you’re inspired to spare a turkey’s life and create a “ThanksLIVING” feast of your own, click here where two of Brasch’s recipes are featured on the web site of the Humane Society of the United States. Another yearly “ThanksLIVING” celebration is held in Mehoopany Township, Wyoming County at the Indraloka Animal Sanctuary founded by Indra Lahiri, who likes to hand feed some of the turkeys she has saved over the years. On the sanctuary’s web site, Lahiri is quoted as saying, “A lot of people don’t know that turkeys are as smart and affectionate as dogs and cats. They will actually crawl in your lap and purr when you pet them.” During the sanctuary’s “ThanksLIVING”, Lahiri and her staff treat the resident turkeys to berries and melons “as a way to recognize the value of all creatures great and small”. Lahiri adds that “The world is a really violent place and we feel like it needs a lot more compassion and kindness and that’s what the ‘ThanksLIVING’ celebration is really about.” Indraloka Animal Sanctuary invites people to sponsor a turkey for Thanksgiving. You can learn more about that by clicking here. Other “ThanksLIVING” events around the country are at the Woodstock Sanctuary in High Falls, New York; the Asha Sanctuary in Newfane, New York; Unity of Dallas Church in Texas; and the Au Lac Gourmet Vegetarian Restaurant in Fountain Valley, California, among many more. Also, ever since Ronald Reagan “pardoned” a turkey named Charlie and sent the bird to a petting zoo in 1987, American Presidents have been keeping turkeys from ending up on Thanksgiving tables. Yet while the occasions at the White House are often tongue-in-cheek and laced with jokes, true believers in the meaning of “ThanksLIVING” maintain that by going vegetarian at least on the holiday and perhaps on all days, you can imbue the festivities with a message of respect and love for every living being that shares our earth with us. Happy Thanksgiving and Happy ThanksLIVING!